While the benefits of consuming more fruits and vegetables are undeniable, like many good things, there is a downside to storing produce in the home – and it goes by the name drosophila melanogaster – the fruit fly. Until the 18th century, scholars and scientists believed in a phenomenon called “spontaneous generation,” theorizing that fruit flies were naturally reproduced from inorganic, foul materials like dirty laundry and rotting meat. While you will certainly find plenty of fruit flies buzzing around the local dump, they can thrive almost anywhere, and even the cleanest kitchens provide a plethora of opportunities to set up shop and settle in. Leaving fresh produce out in your home is kind of like advertising free room and board to fruit flies. Typically, they enter on fruit brought into the home or through open doors and windows. With a life cycle that runs from egg to adult in about seven days, fruit flies can proliferate at warp speed. Females deposit up to 500 eggs at a time, meaning fruit flies can produce hundreds of offspring within a couple weeks. 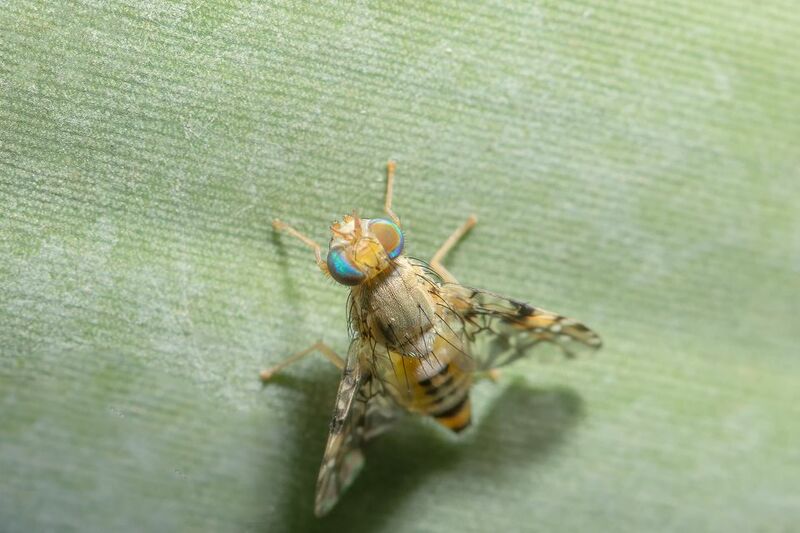 Unlike their insect cousins wasps, spiders and mosquitoes, fruit flies don’t sting or bite. The main risk they pose to humans is exposure to the diseases and bacteria the flies spread by moving throughout the home. While fruit flies spend the majority of their time on fermenting food, they also make the occasional pit stop on plates, cutlery, drinking glasses and even toothbrushes. While you may not consume the contaminated produce itself, when you eat or drink from these objects, you’re exposed to the same bacteria the fruit fly has transported from site to site. Approximately 48 million people a year get sick as a result of foodborne illness. Due to the overwhelming increase of large-scale food recalls, research has determined that fruit flies are a significant vector of Escherichia coli (E. coli), a dangerous food-borne health hazard to humans in the developed and undeveloped world. When you find yourself facing an infestation, eradication isn’t optional – it’s necessary. While fruit flies are drawn to fruit due to its sugar content, anything containing sugar will do. As sugar ferments, it begins to turn into alcohol, which fruit flies love. (Another reason you’ll often find them buzzing around beer bottles and hovering around wine glasses.) Removing sources of attraction from the home is a good first step to resolving a fruit fly issue, but may not be enough to completely resolve the problem. When produce becomes scarce, fruit flies will often move on to sink drains, garbage disposals, empty bottles and cans, garbage bags, recycling bins, compost piles and even damp mops and sponges, perpetuating the problem. Store fruits and vegetables in the refrigerator rather than on the counter. Shut windows and doors. Don’t rely on screens, as fruit flies can fit through the mesh. Use your air conditioner whenever possible. Humid indoor conditions perpetuate and expedite fruit rot, beckoning to fruit flies. Place an oscillating fan near food to discourage flies from landing there. Implement a cleaning schedule, especially during the warmer summer months. Take the garbage out twice a day, scrub trashcans weekly, mop floors and wipe down surfaces every night. At the first sign of fruit flies, purge your produce. Examine fruits and vegetables for any signs that it is overripe, oozing liquid or has been bruised or broken. Do not dispose of produce or scraps in your kitchen trashcan. Bag it up and take it to an outdoor can. Promptly clean up any residual mess from chopping, cooking or prepping meals. Empty soda cans, wine bottles, and beer cans are fruit fly havens. Don’t allow recyclables to sit around. Be sure to give the bin a regular and thorough scrubbing to remove any residual liquid or juice that may have leaked into it. Eradicating breeding adult flies will help slow, and eventually stop, a fruit fly infestation. From vinegar to milk to wine, there are many suggested recipes for creating a DIY fruit fly trap to place in the problem areas of your home. There are also pre-made traps on the market, such as Aunt Fannie’s FlyPunch!, which has an eco-friendly, non-toxic blend of ingredients that attracts fruit flies and kills them naturally—to stop an infestation in its tracks. Fruit flies are no reason to avoid fresh foods. With a little effort, your family can enjoy healthy, nutritious meals and snacks – without a surprise appearance from uninvited guests.